What is the Ideal Back-To-School, In-House Professional Development? I’m a San Marino High School social studies teacher with many years of teaching experience, and you can add my name to the list of those who view the typical back-to-school, in-house professional development (PD) as lacking, whether in terms of interest, information, and/or engagement. The approach employed there features at least one fifty-five minute keynote address, at least two 10-15 minute TED-style ED-Talks, and at least three fifty-five minute Edcamp style discussion sessions . . . all led by teachers, for teachers. The approach, if applied to a back-to-school, in-house PD, would probably look something like this. In the month leading up to the PD, school admins would invite all teachers to apply for a chance to give either the keynote address or an ED-Talk on the day of the PD. • The big idea presentation: One that makes one or two very strong points about something having to do with education and that the teacher feels passionate about. • The tech demo presentation: One that looks at some clever new bit of Ed-tech that the teacher has employed in the classroom. • The small idea presentation: One that is not about one big, world-changing idea, but instead about a very engaging take on an interesting topic related to education. • The issue presentation: One that exposes other teachers to an issue related to education and that they may not otherwise know much about. In other words, both the keynote address and ED-Talks do not always need to focus on how to teach better. A Place for Drones in Education? Teachers selected to give the keynote address and/or Ed Talks would then spend the next several weeks working on their respective presentations, with the goal to have these presentations ready by the day of the PD. Teachers on the day of the PD would arrive with no preset schedule of sessions. At the start of the PD, admins would place a big, blank sheet of paper with a grid on it at the front of the room. From that blank slate, teachers as they mingle and chat over coffee would be called upon to schedule the keynote address, ED-Talks, and discussion sessions. Who have similar interests would end up running one or more discussion sessions together. Would control the quality of each session via the "law of two feet," which states that teachers may leave the room during a discussion session at any time for any reason. 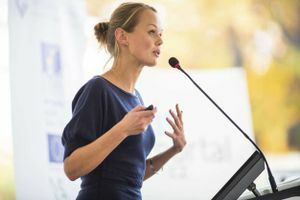 Because leaving midstream is actually encouraged, discussion sessions with weak content or too much presenter talk often end up being sparsely populated, whereas high-quality, interactive discussion sessions are often bursting at the seams. A PD structured along these lines would end with a "smackdown," during which any willing participant may take the floor for 30 seconds to share an idea, tool, or tip. Smackdowns may include music, laughing, and cheering, as teachers and admins try to condense their learning into such a small time frame. PD's like this should invite teachers and admins to run back channels on Twitter during the PD, if only to encourage participants to chat virtually while the live discussions happen. The visionary approach described herein and used at the CA Teacher Summit was created by the Better Together California Teachers Summit Steering Committee. Have any of you ever experienced anything like this at your school? If so, what was it like? How well do you think this approach would work at your school if given a green light?